I think I have a problem on my accelarator cable ... the pedal is hard to move. I checked pedal mecanism, removing the cable attachment, it is not that. So I think that my problem is that the angle at this place is really short. Last edited by Flat4ever; 12-20-2002 at 01:32 PM..
Has the cable been changed recently..... have you had the car for a while. Any additional history you could provide would be helpful... Carbs or Fuel Injected ?? Are you sure there are no breaks in the sheathing? That was the diagnosis for mine a little while ago. Mine works fine when it's not connected at the throttle body. A little tension on it, though, and I've two throttle postions: closed and wide open. the fact is I bought the car two months ago. It was stored for two years. It is carb powered (2 x 44 IDF). 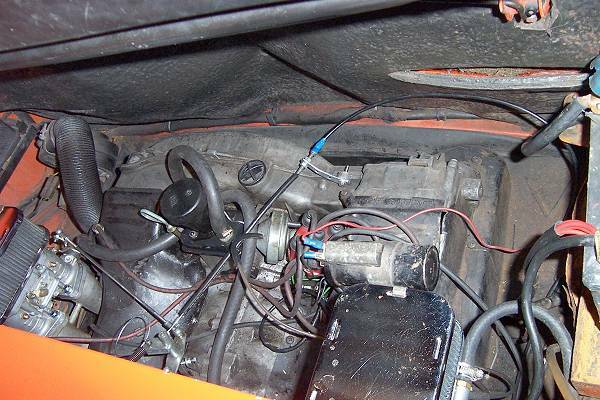 If I disconnect the cable and remove it from the engine compartiment and let it stay horizontally under the car the pedal is smooth and really easy to move. Last edited by Flat4ever; 12-21-2002 at 05:11 AM..
well, if it works when it lays flat, but doesnt work when it is at a funny angle, my guess is that the angle has everything to do with it. maybe post a pic of it attached. Is it a new or old cable? B - the very short angle at the firewall exit. Or better solution if you have, of course ! you have the throttle cable making 2 90 deg bends in a relatively short "run". the bend at the fire wall point is rather ugly. when the sun comes up i'll take a pic of my routing and post it. if the angle of the threaded rods where they connect to the carbs is too steep that can cause a bind also. Personally I think you need a new cable. It'll do wonders over the old one. The sheathing on the inside of the cable housing wears where the bends are. Cables are cheap enough. 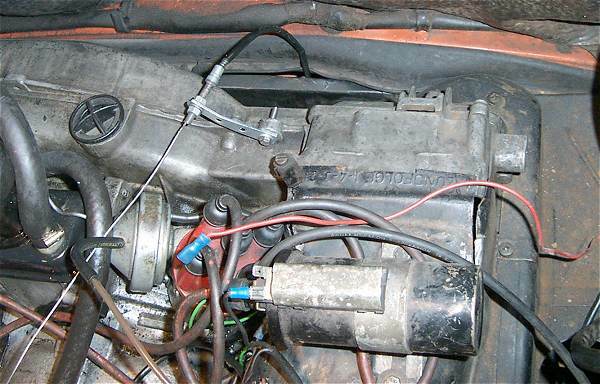 However, I am interested to know the exact place where the cable comes in the engine compartiment. 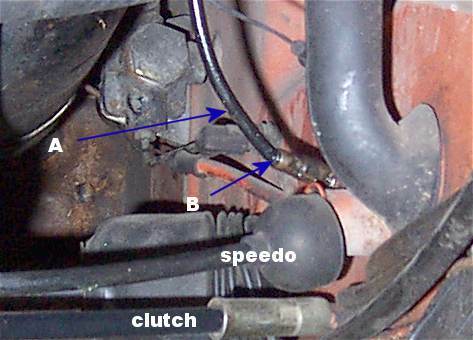 On our stock 1974 2l car the cable exits the firewall and goes to the right some and up through the sheet metal through a hole with a rubber grommet and then loops over the rightside intake runner to the throttle body. On the race car it exits and goes right and up and then makes a looping curve over the right side of the engine. When you get the new cable, before you install it, get a piece of wire such as the plastic coated stuff Home Depot sells and play with different routes from the firewall exit up to the top. Make sure there are no sharp bends like there is now and if you need to drill a hole in the sheetmetal then by all means do that so you get a smooth route. Good luck. I solved the problem . It was the too short two angles at the exit of the chassis and near the fan (see previous pictures). I changed my old cable with a longer one and I used the NORMAL PASSAGE in the metal sheet on the right side of the engine. The new cable make a larger angle in the engine compartiment and now the pedal is perfect and smooth. Last edited by Flat4ever; 12-28-2002 at 10:45 AM.. I have to second the want for a CB linkage. I played and fussed with the exact linkage you now have. Now I just pulled out the teflon liner of the cable housing and routed it similair to yours all is better. Question how stiff is your bracket mounted to the fans housing. I think even my size 8 foot would bend that thus causing your throttle adjustment to go out. the blue thing is rubber tape, to make the cable harder at this place. So, It is not definitive, it is only to have fun in driving the 2.0 waiting the new CB Linkage and filters. So the ball bearings option is also very interesting. Do you have any drawing or pic of this improved linkage ?